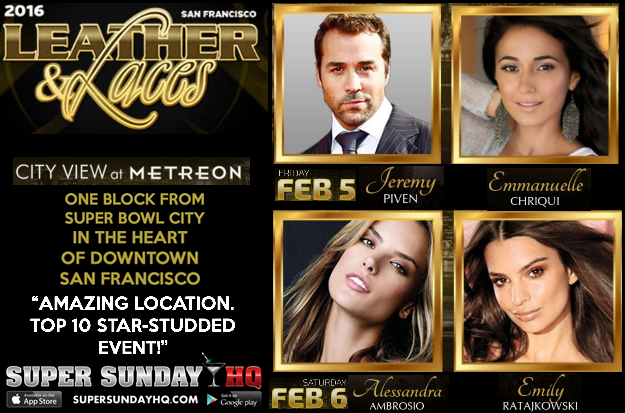 Leather and Laces Super Bowl Party EXCLUSIVE: Jeremy Piven, Emmauelle Chriqui, Alessandra Ambrosio, & Emily Ratajkowski will headline on different nights at Super Bowl 50. 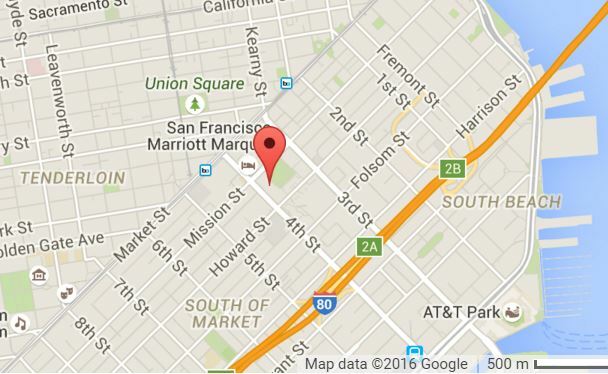 The Leather & Laces parties are set for Friday and Saturday night during Super Bowl weekend in the heart of Super Bowl City and Downtown San Francisco. at City View at Metreon. Besides great music and the opportunity to party among the stars, guests can expect an ultra premium open bar, sushi prepared by Sushi Confidential, and Godiva desserts. While several other event tickets hover around $1,000, Leather and Laces has a General Admission ticket option for around $495. 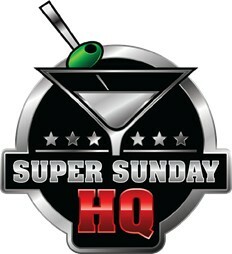 FOR GA, USE CODE: SUPERSUNDAYHQ to get the lowest price on tickets. TICKET LINK. Keep in mind prices and schedule are subject to change and all terms are according to the Official ticketing site. The good news is that Leather and Laces has reached out to Super Sunday HQ and has offered an exclusive reduced price for our users. Click the links above to find the best deal! Since it’s inception Leather and Laces delivers one uncompromising vision: Star Athletes, Hollywood Celebrities and loyal VIP guests in an intimate yet adrenaline fueled experience of the glamor and excitement of Super Bowl weekend! This year will feature “Five-Star Hostess Table Service”, and stunning views from the “Chill Out Terrace”. While other events have a high number of attendees, Leather & Laces will feature an intimate soiree which will give partygoers a great opportunity to stargaze and party the night away. Higher VIP options will allow meet & greets and more. We attended this event last year in Phoenix, and ran into several celebrities throughout the party. Located on the fourth floor of the iconic METREON, City View lives up to its name with floor to ceiling windows revealing an unobstructed view of San Francisco’s renowned cityscape. City View at Metreon is a large scale event venue located at the center of San Francisco. With an expansive 18,000 square-foot interior and a 12,000 square-foot of unparalleled views from an expansive outdoor terrace and an open modern-lux interior space, it’s the perfect venue for Leather & Laces. Celebrity Host Meet and Greet VIP Tickets : (only 10 per night available) comes with all VIP ticket inclusions. Year after year, the “Leather & Laces” party proves to be the hottest, chicest and sexiest place to be during Super Bowl Weekend. Since its inception in 2004 in Houston, Texas, the party quickly became a bona fide hit with more than 3,000 guests entering through the doors at the sold-out event. Because of the demand, there are now two nights to attend…..the ONLY party at Super Bowl to do so. Fashion, style and pure sexiness are the flavor of this party; where the cool, trendy, rich and famous flock to enjoy hand-rolled Sushi, open bars with top notch beer and wine, ultra premium liquor, as well as trays of delectable hors d’oeuvres and desserts which are passed among the sleek-dressed guests by incredibly beautiful women. In this high end celebration, the best Celebrity DJ’s in the world take it up a notch which translates into hot bodies and lots of glitter as people swarm in on the dance floor in a frenzy of dancing and singing. Cirque du Soleil performers and nationally recognized magicians and illusionists are added elements meant to enhance the experience. With two sold out nights and a bevy of Hollywood celebrities and athletes as guests every year….. It is a proven fact; “Leather & Laces” represents all that the Super Bowl weekend is meant to be: glamour, glitz and excitement! He is an American actor and producer. He is best known for his role as Ari Gold in the comedy series Entourage, for which he won one Golden Globe Award and three consecutive Emmy Awards. Piven’s first important role came in 1992 when he became a regular cast member on HBO’s The Larry Sanders Show, in which he played the head writer Jerry. In 1993, he portrayed George Costanza in the Seinfeld episode, “The Pilot”. Piven was a cast member on the last three seasons of the sitcom Ellen. He was also the star and producer of the ABC dramedy series Cupid . Piven has appeared in many successful films, including Lucas, Grosse Pointe Blank, Singles, Very Bad Things, The Family Man, Black Hawk Down, The Kingdom, Heat, PCU, Old School, Rock N Rolla, Serendipity, Smokin’ Aces, Runaway Jury, Rush Hour 2 and Cars. Alessandra Corine Ambrosio is a Brazilian model best known for her work with Victoria’s Secret and was chosen as the first spokesmodel for the company’s “PINK” line. Ambrosio is currently one of the Victoria’s Secret Angels and has modeled for brands such as Next, Armani Exchange, Christian Dior, and Ralph Lauren. Ambrosio serves as an ambassador for the National Multiple Sclerosis Society. Ambrosio was also selected by AskMen.com as Number 2 out of the “Top 99 Most Desirable Women of 2008”. Emily was born in London, England. She started modeling at fourteen-years-old and was signed by “Ford Models”. After shootings with Tony Duran, she became recognized as a fashion model. Later, she was on the cover of “GQ Turkey” and appeared in Robin Thicke’s music video, “Blurred Lines”. As an actress, she played “Tasha” on the “Nickelodeon” series, iCarly in 2007, and the mistress of Ben Affleck’s character in the thriller Gone Girl (2014). She also appeared in the film version of Entourage (2015), and co-starred with Zac Efron in the musical drama We Are Your Friends (2015). She graced the cover of the 2014 Sports Illustrated Swimsuit Issue. Among her other cover appearances are GQ, British GQ, Cosmopolitan, InStyle UK and FHM. Founded in 1984, Cirque du Soleil is French for the “Circus of the Sun”. It is Circus that mixes Circus Arts and street Theater, special effects and spectacular costumes. Cirque USA is constantly reinventing the idea of the Circus and trying to defy the limits of reality. Its performances combine elements of street performances, Circus Opera, Ballet, and Rock Music. Jim Karol, mentalist and memory extraordinaire has been seen by millions from his appearances on NBC’s “Phenomenon”, “The Tonight Show” with Jay Leno, “The Ellen Show”, Howard Stern and “The Today Show”. Some of Jim’s extraordinary abilities include memorizing a shuffled deck of playing cards in less than a minute and knowing the day of the week for every date since the beginning of the calendar. Jim has held three Guinness World Records and has led many people to believe that he can actually read minds! DJ Zhaldee grew up in the San Francisco Bay Area’s rich DJ Culture. He started deejaying in the summer of ’88 and quickly became the hometown favorite, tearing down all the local house parties and school dances. Determined to make his mark in the music industry, he pursued production and studio recording. After a few years hiatus, Zhaldee found himself practicing his craft again and agreed to DJ the “Spirit Party” for Southwest Airlines on the USS Hornet Aircraft Carrier in Alameda, CA. More than 5000 party people screaming their lungs out on the deck of the carrier in the San Francisco Bay convinced Zhaldee that he needed to return to his first love (the turntables). Ever since then, the sky has been the limit. You can now hear Dj Zhaldee on The Bay Area’s own Q102 every Saturday Night! Zhaldee holds residencies in some of the hottest clubs between San Francisco, San Diego, and Las Vegas. He has shared the stage with DJ Jazzy Jeff, DJ AM, Clinton Sparks, and DJ Shortkut just to name a few. Zhaldee has headlined events hosted by Kobe Bryant, Carmello Anthony, Sammy Hagar, Sean Kingston, Trey Songs, Cali Swag District, and the list goes on.